FMS in Perspective. FMS: an investigation for research and applications (A. Gunasekaran, T. Martikainen, P. Yli-Olli). FMS planning since the early eighties - experience, recommendations and future tendencies (H.-J. Warnecke, R. Steinhilper, H. Storn). Flexibility Issues. 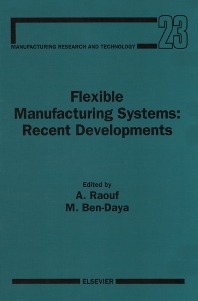 Manufacturing systems: flexibility assessment (A. Raouf, M.F. Anjum). Flexibility and productivity in complex production processes (S.-O. Gustavsson). Flexibility in pull and push type production ordering systems - some ways to increase flexibility in manufacturing systems (R. Muramatsu, K. Ishi, K. Takahashi). FMS Planning. FMS short term planning problems: a review (M. Ben-Daya). Loading models in flexible manufacturing systems (A. Kusiak). Production planning model for a flexible manufacturing system (P. Chandra). Heuristics for loading flexible manufacturing systems (E.K. Stecke, F.B. Talbot). A framework for developing maintenance policy for flexible manufacturing systems (A. Raouf). FMS Control. FMS planning and control -analysis and design (C. Bérard, L. Pun, B. Archimède). Control system design for flexible manufacturing systems (F.L. Lewis et al.). FMS Applications. A computer integrated robotic flexible welding cell (J.E. Middle, K.H. Goh). Idea and practice of flexible manufacturing systems of Toyota (A. Masuyama). Flexible Manufacturing Systems (FMS) involve substituting machines capable of performing a wide and redefinable variety of tasks for machines dedicated to the performance of specific tasks. FMS can also be programmed to handle new products, thus extending the machines' life cycles. Thus they represent a change from "standardized goods produced by customized machines" to "customized goods produced by standardized machines". This volume contains new and updated material in this field, and will be of great interest to researchers, managers and students concerned with problems related to flexible manufacturing systems.